Just made this for dinner tonight (sorry I didn’t get more pics, I didn’t know I’d be sharing) and it rocked!!! It’s basically lasagna in jumbo pasta shells and the only thing we don’t normally keep in the house is ricotta and shredded mozzarella (but they’re both easy to come by). I’m very proud of this considering I did zero measuring and only got the idea to stuff shells from a recipe. Yes, I’ve never made any dish with these jumbo pasta shells before. Is that weird? I don’t care. Try this soon, you won’t be disappointed! 1. Cook shells according to package instructions until al dente. Rinse in cold water long enough for shells to cool enough to touch. 2. Drizzle olive oil to cover an 8″x11″ baking dish. 3. Mix cheeses (leaving some mozzarella aside), beef, egg, seasoning and a little pasta sauce in a large bowl. 4. Fill shells with mixture and place in baking dish. 5. Cover with pasta sauce, sprinkling the remaining mozzarella over the top, and bake at 350*F for 1 hour. You want to be sure to completely cover the shells with sauce. Have you ever baked pasta that wasn’t covered by liquid? Crusty, gross noodle is the result (made that mistake with lasagna rolls a few years ago). You can also make the stuffing ahead so that all you have to do is cook the noodles and stuff them. 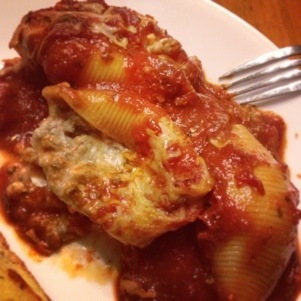 Serve with garlic bread and it’s an easy meal for a week night! Replace the beef with chicken, if you want! YUUUM!!! Did you make extra for me? I’m thinking about making another batch to freeze! All I need is more mozzarella! I’ll probably just omit step 5 and freeze them in a Ziplock. Makeup/hair/nails night food?